During our week celebrating precision audio, you guys asked about respectable but affordable home-theater audio. So we hit up CNet's Audiophiliac, Steve Guttenberg, to clue us in to three exceptional 5.1 speaker/subwoofer combo packages selling for $800 or less. Energy is big on small speakers. Their RC-Micro 5.1 system ($600) includes four satellite speakers that stand a mere 4.7 inches tall, and the center speaker isn't a whole lot bigger. The wee 240-watt, 8-inch subwoofer is a seriously gutsy performer. The big catch with most little systems is they crush wham-bam dynamics, and their bass either booms or runs out of gas. No problem here, the RC-Micro 5.1 belts out bombast like a larger system. It's simply one of the most refined sounding micro systems I've heard to date. The Mirage Nanosat 5.1 Home Theater ($600) sounds unlike any box-type satellite system on the planet. Conventional speakers project sound forward, the Nanosat speakers produce a ratio of 30 percent direct and 70 percent reflected sound. The direct sound heads straight to the listeners, while the other 70 percent bounces off the room's walls and ceiling before finally reaching the listeners. With the room lights turned off, the Mirage satellite speakers can literally disappear as sources of sound. 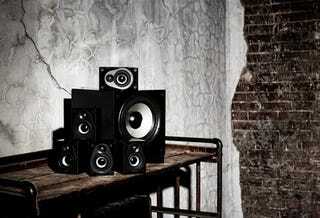 The system comes with five identical satellite speakers and a rather potent mini-subwoofer. Definitive Technology is a high-end speaker company, but it is one that has learned how to sell its products for a lot less than high-end prices. Take the ProCinema 600 six-piece satellite-subwoofer system ($800). Clever engineering solutions make for an exceptional package. For example, the system's injection-molded mineral-filled polymer speaker cabinets have more of a high-end feel than more typical plastic or fiberboard cabinets. The 250-watt, 8-inch subwoofer has a second 8-inch "infrasonic radiator," in order to produce extraordinary deep-bass slam. The ProCinema 600's resolution of fine detail, razor-sharp imaging, and dynamic kick are the stuff that make high-end worth it. Listen and you'll see. For more details and full reviews of these three amazing systems, head over to The Audiophiliac. Steve Guttenberg's CNet blog, The Audiophiliac covers high and low-end audio and everything in between. He's been reviewing audio components for 14 years. He has never ever heard anyone make a Police Academy or Short Circuit joke about his name. Ever.